During periods of high-water, as outlined below, the Rocky Ripple Emergency Evacuation Plan will guide the community response. Please review the plan as part of your own preparations. The Rocky Ripple Emergency Management/Community Emergency Response Team (RREM/CERT) has devised a communication system to provide residents with current information regarding the river levels and the potential for flooding. During periods of heavy rains or melting snow, placards are to be placed in the town notification boxes located at the intersections of 52nd Street & Byram Avenue and 53rd Street & Sunset Avenue in Rocky Ripple. The colored squares displayed on the notices will correlate with the river levels below. This action will be prompted by information obtained from the National Weather Services Advance Hydrologic Prediction Service and visual observation. The information below references the Rocky Ripple gauge located behind the Town Hall as well as the Nora gauge in parentheses. Learn more about Rocky Ripple’s RREM/CERT team and emergency response. Issued when rising water can impact life and property. Be prepared to take action if rain or snow melt continues. See recommended actions for orange alert below. Phase Purple: Evacuate–Breach is imminent or has happened. Flood in progress. In the event of a major flood and high water breeches the levee, the emergency evacuation horn will be sounded and all emergency alert notifications will be sent to residents and local authorities. Residents should leave Rocky Ripple immediately. Pre-plan a temporary place to stay. Notify your alternate shelter/housing to be on standby. Pre-plan any additional assistance required for evacuation of an elderly or handicapped person. Notify the assistant to be on standby. Be sure to arrange housing for your pets. Attach identification to your pet and pack several days’ worth of food and any medication. Have these items easily accessible. Locate all important documents, personal items, identification, and/or medical supplies. Secure any valuable items from low lying areas. To monitor the current river levels, refer to Web site www.crh.noaa.gov/ind/ or contact a member of the RREM/CERT team. The above information is based on predictions and suggestions. Please use your best judgment when deciding to evacuate , and above all, don’t panic. A gauge is located behind the Town Hall on the river bank. During the January 2005 high-water event, the river crested at about 15 feet on the Rocky Ripple gauge (that’s equivalent to 18.45 on the Nora gauge). In the event the river rises to 15 feet on the Rocky Ripple gauge, town officials will call for a voluntary evacuation. See American Red Cross “Flood Safety” or FEMA “How to Prepare for a Flood” to help you prepare. Read message boards near the bridges into Rocky Ripple or outside the Town Hall. Secure a place to stay outside of Rocky Ripple for you (and your pets, if applicable). Collect valuable papers, medicines, clothes and toiletries to take with you. Note that the Red Cross shelter is located at 441 E. 10th St., Indianapolis. They do not accept pets. Pets can be taken to the Humane Society for temporary accommodations. If you have questions, contact a member of the Town Council or member of the RREM/CERT team. Andy Hazel, RREM/CERT leader, can be reached at 317-796-0931 or Jill Morris can be reached at 257-9757. Or write to rrem@rockyripple.com. If you know of a resource that we should add, contact the webmaster. 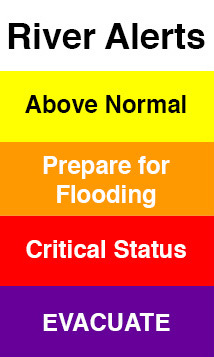 Since the White River is very much a part of the Rocky Ripple community is, below are links to River-related information and the Emergency Response Color-Coded System. More information is available at the National Weather Service Forecast Office Web site. 22.4 Flood waters reach a record flood height. Scores of evacuations are necessary. Flood waters reach the bottom of 86th Street at 26 feet. Maximum reading possible at gauging station is 26 feet. 19.0 200 to 400 homes flood. Water overtops a local levee. Major flood is in progress. Water is at the top of levee in Rocky Ripple. May be concern about levee near Meridian Street. Local recreational area floods. Luxury home ($500-600,000 in 1992 dollars) located on Beach Avenue have 3 feet of water in their basements. 18.5 An agricultural levee may fail at the Connor Prairie Farm located in southern Hamilton County. 18.0 Major damage occurs in Ravenswood area. 16.0 Many homes experience basement to first floor flooding near White River at 116th Street and at Ravenswood. River Edge roads flood. 15.3 River Road just north of 86th Street near Fashion Mall at the entrance to condominiums begins to flood. 14.0 High water closes East 77th street near Mystic Bay. River Road floods. River Edge Lane and River Road just north of 86th Street flood. Lowest residential areas begin to flood on River Edge Lane. 12.5 East 77th Street near Mystic Bay begins to flood. 12.0 69th Street bridge closes. 11.5 A few streets flood in Ravenswood. 11.0 Local roads begin to flood. Approach to 69h Street begins to flood. Water is at the edge of River Edge Lane and the section of River Road located north of 86th Street and south of I-465. 8.5 Backyards of a few homes begin to flood in the Ravenswood area.